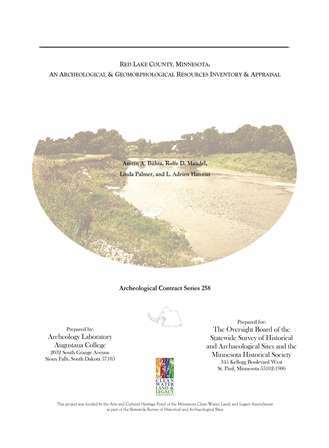 The Office of the State Archaeologist (OSA) has posted a public version of a report completed by the Archaeology Laboratory of Augustana College on the archaeology of Red Lake County, Minnesota. The primary objective of the study was to expand the breadth of collective knowledge concerning the location and character of archaeological sites in Red Lake County. The survey documented 24 previously unrecorded sites and revisited 9 previously recorded/reported sites in the county. Prior to the survey there were 8 recorded sites in the OSA sites inventory. Local artifact collectors were interviewed and their collections documented. The study was also augmented by a geomorphological investigation. The county survey was funded by the Arts and Cultural Heritage Fund of the Minnesota Clean Water, Land and Legacy Amendment as part of the Statewide Survey of Historical and Archaeological Sites. Here is a link to the report. It is a 9 MB file so it might take a while to download.